While stunning interiors are essential for every superyacht, few spaces truly get used quite as often as a yacht’s al fresco areas. 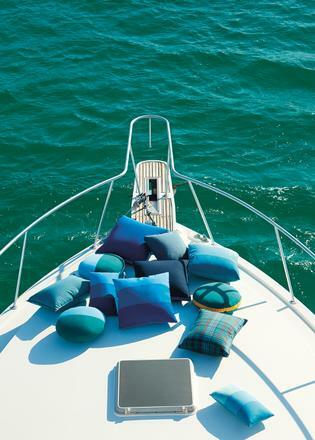 Be it the sundeck, beach club or aft deck dining area, yachts are all about outdoor living and, thanks to international fabrics brand Sunbrella, there is now no need to compromise your interior design aesthetic in these spaces. Founded more than five decades ago on the ethos that fabrics should be both functional and beautiful, Sunbrella has grown to become one of the world’s leading names for high-performance and easy-to-care-for textiles, suitable for a variety of environments. Having been a favourite among superyacht interior designers for years, for 2018 the brand has added 112 new fabrics to its EU Marine line, creating a collection that now comprises 205 designs and sets the bar for elegant, durable fabrics in the nautical sector. Designed by Sunbrella’s in-house team and manufactured in its European factory in Lille, northern France, each and every textile in the Marine range has been engineered to withstand the specific environmental challenges – the likes of strong sunlight, salt water, rain, UV rays and chemicals for sun cream – that are unique to the yachting environment. This is particularly evident in two new fabrics, Source and Optimum, which make their debut in the Marine collection for 2018. Optimum offers double-sided designs and is 100 per cent waterproof, while Source establishes Sunbrella’s commitment to sustainability with an ecologically sound production method and design resulting in zero waste. Recommended for hoods, biminis, protective covers and rear closures, both fabrics are perfect for use on powerboats, sailing yachts and motor vessels and are manufactured to withstand the harshest of marine conditions. Of course, durability is important but is of little use if the fabrics don’t also look appealing. 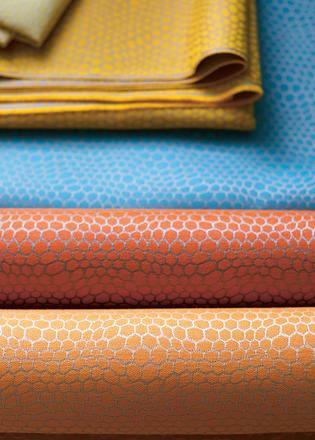 Split into four trend atmospheres – Perform, Smart, Together and Wander – Sunbrella’s Marine fabrics are available in a huge range of solid colours and patterned designs ideal for sun loungers, cushion, blankets and bedding. 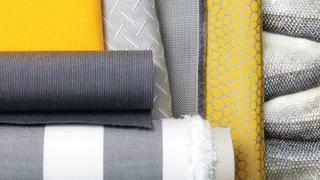 Also new for this year is a range of six elegant Jacquard fabrics, four of which are reversible, available in both neutral tones and bright colours, and aimed at catering to all interior design tastes and styles. Sunbrella’s reputation for fabrics that are built for life on the water – easy to clean and resistant to the effects of salt and mildew and with colours that do not fade – has seen the brand work with yacht builders across the world includingNautor’s Swan, Couach Yachts, Wally, Sunseeker and many more. If you’re looking for inspiration for your own yacht, notable recent collaborations include a project with Wauquiez for its Pilot Saloon 58 motor yacht. Eleven Sunbrella fabrics were used on board this classic vessel, including the brand’s core upholstery textiles for benches, backrests and beds as well as a number of fabrics from the Marine collection for outside spaces, demonstrating the versatility of Sunbrella’s fabrics. Meanwhile, an ongoing relationship with French catamaran specialist Lagoon saw Sunbrella outfit the brand’s first yacht over 24 metres, the Seventy 8. Sunbrella worked with Lagoon’s designers to create a calm and relaxing décor scheme, for both interior and exterior areas, which highlighted the wide beam and light-filled spaces inside the yacht and created a serene, Zen-like atmosphere outside. Aimed at inviting guests to enjoy their surroundings while providing practical options in terms of shade and comfort, these two projects provide just a snapshot of what Sunbrella’s 400-plus products can achieve on board a superyacht.